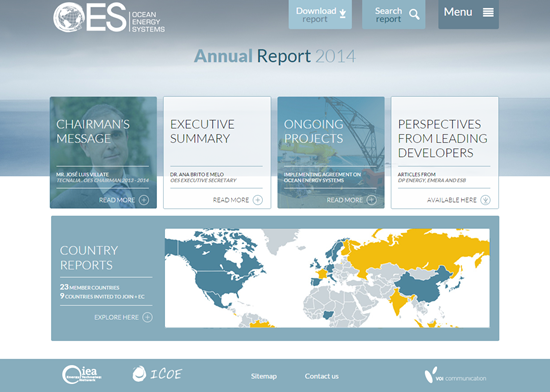 The OES Annual Report 2014 is now online! Last year saw a marked rise in the amount of government grant funding for ocean energy projects around the world. Many new test rigs are already showing positive results and some developers are in sight of their first pre-commercial projects. The Ocean Energy System’s (OES) annual report on the state of the industry (out today) provides a comprehensive overview of international developments on ocean energy. In a country by country analysis of its 23 members, the report details projects as diverse as a Salinity Gradient energy plant in the Netherlands and the installation, in Sweden, of the first ten generators of the Sotenäs project through a number of river current technologies being tested in Canada and the Drakoo wave energy converter in Singapore. José Luis Villate, Chairman of OES said: “Our mission is a long term one; ocean energy is still a small player on the energy stage. I am confident that today’s report will help accelerate international collaboration in the development of ocean energy”. To highlight the work being done three leading project developers - Emera (USA) , ESB (Republic of Ireland) and DP Energy (a worldwide independent renewable energy company), were asked to give their views on the present challenges and opportunities in the development of ocean energy. The questions asked of them covered their short to medium term plans, critical risks, stakeholders and their views on international collaboration. Today’s report answers these questions and many others covering the whole spectrum of ocean energy technologies. In The United States many projects were deployed and tested during 2014 with grant support from the US Department of Energy (DOE), with others planned. In Canada four developers received approvals to be developed at FORCE site, totalling 17.5 MW. Projects on wave and current energy have been progressing in Spain, Portugal, Italy, Denmark, Norway, Sweden and The Netherlands. In Korea important milestones have been achieved with the successful construction of the 500 kW demonstration OWC plant and the 200kW OTEC plant. China upgraded to 4.1MW the largest tidal power Jiangxia with more than 30 years of operation. The OES Annual Report also serves as a useful tool to promote the OES activities for international policy-makers helping to identify key areas where improvement is most needed, in line with its mission of collaborating internationally to accelerate the viability, uptake and acceptance of ocean energy systems in an environmentally acceptable manner. Ocean Energy Systems (OES), also known as the Implementing Agreement on Ocean Energy Systems is an intergovernmental collaboration between countries, which operates under a framework established by the International Energy Agency in Paris. Presently, the OES has 23 member countries with a number of other observer countries in the process of joining.